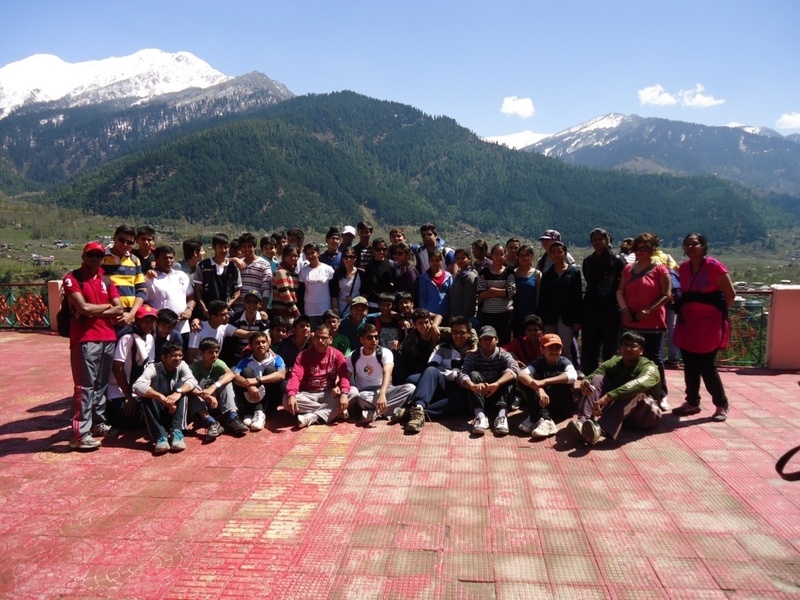 53 Award participants from The Sanskar Valley School, Bhopal completed their Adventurous Journey from 22nd - 29th March 2013. The group comprised 17 girls and 36 boys, a combination of students in residence as well as day scholars. The composition of the students, a combination of students in residence as well as the day scholars was as heterogeneous as the different legs of the entire journey. Unavoidable was the cultural comparison between the soils of Bhangra, the heart of India that is M.P. and the chills of Himachal. The transition from the plains to the hills, from the deciduous to the coniferous was magical and a complete visual learning. We arrived at 'Manu Allaya' a resort in the Himalayas, on March 23, 2013. The resort is located 600 mtrs north of Manali on the road to Rohtang Pass. The resort lies on the hill-top overlooking the river Beas and snow covered Himalayan Ranges. We were lucky to witness snowfall. It was a chilly morning which sharpened the students’ appetites for an adventure to the outdoors. A sunny morning on the 25th motivated us to give up our comforts to get close to nature. We camped on the banks of the river Beas. A trek of 4kms was the first warm up to gear up for some more exciting adventures ahead. At the end of the trek, we visited a monastery where we saw the doctrines of Buddhism depicted in the inevitable wheel of life based on 'Karma'. Rappelling got the adrenalin flow high with everybody doing their best!! Dancing to the tunes of the latest melodies the chill night was warmed up around the bonfire where students shared their experiences. Sleeping bags were an effective retreat for the tired only to be regimentally up by 6:00 a.m. for a long trek into the woods (around 5kms). It was 26-03-13 and some more adventure in the form of flying fox and river crossing proved thrilling as the tedious exercise only left the students asking for more. A rope tied from one bank of the river Beas to the other was the only support for the teams which had to cross. The activity was first displayed effectively by the instructors Mr. Atul Chamoli and Mr. Himani Das in order to boost the confidence level of the students. The students were instructed on the theoretical aspect of pitching a tent which they later had to demonstrate practically. The day at the camp ended with an exciting match of tug-of-war. Yes it was the 27-03-13 and the Solang Valley was to be explored in the rented snow friendly attire where skiing, snow fights, paragliding and snow scooters were the major attraction. Manu temple and the temple of Rishi Vashisht was the visit planned for the 28-03-13.Some factory outlets where shawls and other winter wear were manufactured were also visited at Kullu on the way back by road. To give oneself a moment to identify the metal within..."
COOKING ISN'T A REALLY EASY JOB, ITS A SKILL! Everybody loves tasty food. And what I learnt on my trek was that when you cook food yourself in a cooking adventure, it tastes even better! Cooking is a skill. One must know how to cook and what are the necessary ingredients needed to make that recipe. Indian food is famous and there are Indian restaurants all over the world. Even back in the 14th century the popularity of Indian ground spices led to it being imported by many western countries. Kerala produces one of the best spices. Traditional Indian food is very aromatic and full of ground spices. Every state has its own traditional recipe. From North to South and East to West we can see thousands of different and delicious dishes. North India has Mughal influence whereas East has Chinese influence. We can also see that foreign countries have a lot of impact on our Indian food. One of the examples is America and its fast food restaurants in India like McDonalds, KFC, PIZZA HUT, DOMINOS AND AMERICAN PIZZA. 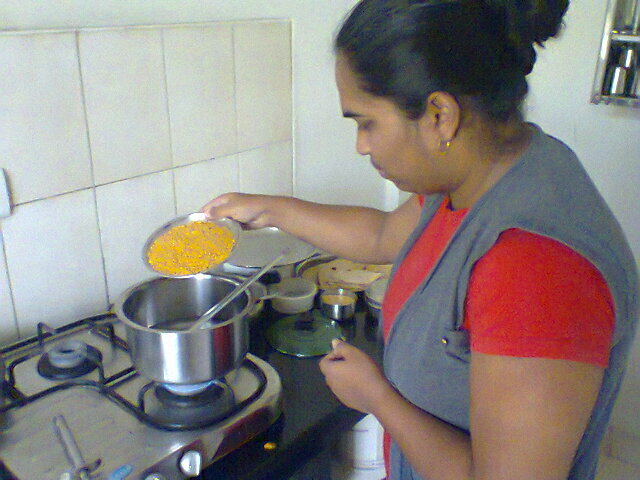 Cooking isn't a really easy job one must need patience to cook food! We should know the right technique to cook food and method. But cooking isn't a rocket science! During one of my trips to Nagarhole in Karnataka for the trek, we cooked simple Indian food - Dal with Rice - on the cooking gas which was available. It was my first experience to cook and to learn what the quantity and requirements for cooking are. All my friends enjoyed it and said it tasted perfect. I feel cooking is an art or skill to make the food tasty and loving. The Training for Trainers (T4T) workshop for the Asia Pacific Region was held from 2nd to 4th April 2013 at Jain International Residential School, Bangalore. The workshop was inaugurated by K L Ganesh Sharma (CEO of JIRS) and a lamp was lit by the legendary Indian Tennis and Davis Cup coach Enrico Piperno along with Rob Oliphant (Regional Programme Manager APR), Kapil Bhalla (National Director, IAYP India), Bivujit Mukhoty (Programme Manager, IAYP India), Skand Bali (Head NTP). Eighteen delegates, of which eleven from India and seven from the Asia Pacific Region participated in the workshop. The eleven delegates from India, including Parul Viz (Uttarakhand); Rashmi Khanna (Chandigarh); Rashmi Krishna, Teena Machaiah, K S Biradar, Onkarjeet M P Singh (Karnataka); Ani Yepthomi, Andrew Ahoto Sema (Nagaland); Ranjit Singh (Punjab); Sudha Sivadas (Uttar Pradesh) and Kapil Bhalla (NAA). The APR delegates included T L Thanuja Ruwani Vijesinghe, Lasantha Dilshan Weligamage, Edirisinghe Arachchige Mallika, Sanjeevi Solaman Viyanikala, Kandasamy Shivakumar (Srilanka) and Al Taylor, Sue Taylor (Nepal). Rob Oliphant moderated the workshop with assistance from Skand Bali and Bivujit Mukhoty. There were different sessions related to the philosophy of Training and detailed presentations on methods of training. Besides the presentations the delegates also participated in different activities, physical and creative, which helped them to understand the essence of the Award Training Philosophy. During the workshop the delegates got the opportunity to meet Mr Chanraj Roychand, Chairman, Jain International Residential School and the staff who helped in successfully organizing this workshop. The workshop concluded on 4th April with a ceremony in which certificates were awarded, followed by a dinner hosted by the CEO and staff of JIRS.